A free-from-everything-but-flavour ice-cream, frozen yogurt and shake spot. 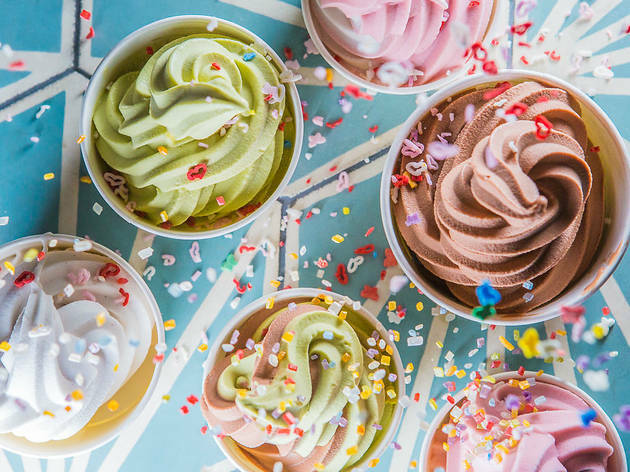 A dairy-free frozen yogurt place sounds pretty rank, right? Wrong. That’s if you can get past Yorica!’s horrible name, avoid the perfectly okay frozen yogurt and head straight for the outstanding vegan ice-cream. Whether you keep a dairy-free diet or could star in a “got milk?” advert, you’ll be very pleasantly surprised. Everything in there is dairy-, egg-, gluten- and nut-free, which makes you wonder what exactly is in the WOW Butter to make it so creamy, indulgent and peanut-butter-like. What’s great about this place is that it isn’t relying on the gratitude of vegans for being given just any sort of ice-cream. It in fact has a great selection of flavours: from the more unusual but brilliant beetroot and chocolate, and the delicate violet, to a surprisingly-good-given-that-it doesn’t-contain-any-cream cookies and cream. The bright-blue nostalgia-inducing bubblegum flavour is probably Yorica!’s marmite, but I loved it. Go with a group of friends regardless of their lactose tolerance status, and share a few scoops. Discovery Yorica on a rainy day! My friend and I were looking for a cheap'n'cheerful place while waiting for the rain to stop. Since then, I got back a couple of time as the ice creams are absolutely delicious, all completely vegan and allergen free. So it's great to have more options than watery and tasteless sorbets when you're allergic to dairy. They have interesting flavours and fun toppings. My favourite ones are the matcha and vanilla fro-yo, and Rainbow Candy, Banoffee, Passion Fruit, and Choco & Mint ice creams. The only negative point is the shop. It's too small with only few tables, so you need to be lucky to get a seat to enjoy your ice creams. I hate froyo (it just tastes like sour milk), but Yorica! 's dairy free ice creams are delicious. They have a really impressive selection of vegan gelato flavours such as 'Rainbow Candy,' 'Salted Candy, and 'Passion Fruit' (my favourite being cookies and cream) which, once you've decided whether you want served in a cup, cone, crepe or waffle, you can then pimp out with various extras including sprinkles, fruit, popcorn, Oreo-style biscuits and more. It's not quite up to the dairy-free standards of nearby Gelupo's offering, but it's definitely up there. I randomly came across Yorica and I'm so glad I've finally found a dairy free ice cream spot in London that does a delicious range of flavours! Usually for vegans it's sorbet, so its great to be able to have the ice cream flavours I used to love! I enjoyed the peaNOT butter and chocolate orange ice cream, Both were delicious! It is a bit pricey for ice cream, but I would definitely go back. We discovered this place by chance when we had dinner on Wardour Street and were pleasantly surprised. The prices are great and the portion sizes were huge - we had the smallest cup and were struggling to finish our Fro-Yo. Using the sprinkle machine is an art I have not yet learnt, but it was fun to try! A cute place that's a little bit different. Perfect 'free-from' dessert bar to pop into on a hot summer's day. I finally managed to visit Yorica on an extremely sunny Sunday. To my surprise it wasn't extremely busy and I didn't have to wait long before being served. Such an array of flavours, toppings and sauces it's hard to decide. I love being able to have a large variety to choose from, as a vegan it is very hard to come across frozen desserts but now everything is at my finger tips! With summer on the way- make sure you head to Yorica and grab the largest tub possible as there's so much goodness to try. I recommend matcha fro-yo with a topping of raspberry sauce and blueberries. Visited this 'free from' dessert cafe on a cold january evening and it didn't disappoint. My ceoliac friend was delighted to hear that the crepes and misc toppings were all gluten free - including delicious looking brownie bites. We shared a crepe and generous portion of frozen yoghurt with raspberry jam and a rich dark chocolate sauce. It was delicious. The decor was fresh and inviting, a great addition to Wardour street - I'll definitely be back to try their shakes and ice cream when the weather warms up a bit! Not at all my cup of tea. The portions are huge, but I could not find any pleasure neither in the vanilla, nor the chocolate version. Funny texture, coconut taste present and very skimpy toppings (paid separately, which wasn't 100% clear on menu) made it a less than enjoyable experience that left 3/4 of the bowl untouched even as it was shared by two. I get that they're catering for people with eating restrictions and all, but I believe there's truly more pleasure in eating a juicy fruit for dessert. And I love desserts. I might be wrong, but my guess is that they won't be around for next summer. My brother and I decided to share a cup because we were quick full from our dinner but also because our server let us know that even the smallest cup was quite a large portion already and definitely sufficient to share between 2 people. He was not lying! The smallest cup cost us £3.50 but contained so much frozen yogurt, we couldn’t finish it all! We decided to go for a mix of two flavours – Matcha Green Tea and Chocolate. Both flavours really complimented each other well. The matcha frozen yogurt on its own was pretty decent in taste and strength given that it was made with an alternative milk. I could still taste the earthiness from the matcha but it wasn’t overpowering. The colour of the frozen yogurt was a much lighter green than you would normally find with a matcha ice cream, which put me off at first but after trying it I found it to be good enough. As for the chocolate, it was also pretty good and strong enough to hide the grainy taste of the rice milk without compromising on the flavour of chocolate. We opted not to put any toppings because we wanted to enjoy the frozen yogurt but they have a counter where you can add sprinkles of different colours and shapes for free! Of course they also have other toppings such as fresh fruits, sauces and sweets or cakes for an additional price. If you’re looking for a vegan friendly dessert place in the Soho area, this is a recommendation I’d give. They have a few frozen yogurt flavours to choose from and even more ice cream flavours on display. The portion sizes are crazy generous – we saw people ordering milkshakes and they came in a ridiculously large cup too! Dessert mecca and loving whole food vibes for anyone on a free from anything and everything diet. Extra wholesome points for the focus on pure, whole ingredients, no fake stuff or loads of e-numbers and artificial sweeteners. Some good flavour options for ice-cream (including non-nut 'Wowbutter' flavour) and amazing range of toppings, including vegan gluten free oreos (oh how I miss biscuits), vegan gluten free brownies and coconut whipped cream. I would only question the rice milk in all the ice-cream, which gives a bit of a watery flavour, personally I think they need some coconut milk in there for creaminess. But it's still a safe and happy new dessert stop for anyone looking for healthier, more wholesome treat option. This place is a heaven for people with dietary restrictions but still want to indulge in cooling, comforting desserts like ice-cream and frozen yogurt. You can pick from a few flavors of frozen yogurt, and top it up with several toppings like cookies, strawberries, marshmallows and yes,free sprinkles. Overall, a nice place to take a break and enjoy a lightish dessert. A treat palace for people with dietary restrictions, with some creative flavours (e.g. chocolate beetroot), enthusiastic staff, and a great Soho location. In terms of value for money, the sugar sprinkles and cones come at no extra cost. 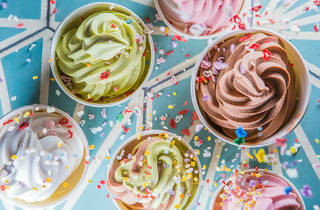 There are several varieties of frozen yoghurt, a larger selection of non-dairy ice cream, and plenty of topping options, from the standard (crushed cookies) to the clever (popcorn). A beautiful hidden place in the middle of Soho, offers ice cream, frozen yogurts and milkshakes to those who can't or won't consume dairy. My friends and I met there, they had ice creams and milkshakes, I had a frozen yogurt (pictured), it was delicious to all of us! I went a bit mad- in a good way- because I haven't had a frozen yogurt since I became vegan a few years ago. It tastes so good and you can't tell either way what's it made of. Just that it simply tastes good. Looks like they also have a lot of good business, there were a few ice cream shops in the area, and Yorica was constantly busy while we were there!